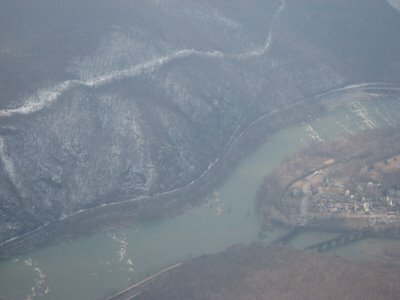 On Sunday Eric G. and I flew to Charlottesville, Virginia, with a detour for a sight-seeing flight over Harper's Ferry. We were going to leave early, but the runway was coated with a thick blanket of fog. (That wouldn't have prevented us from taking off, but could have prevented us from landing if we decided we needed to turn back to the airport for any reason.) So we got coffee and breakfast sandwiches from a nearby McDonalds and waited a bit until the weather cleared -- it was a truly beautiful spring day, as you can see from the blue sky in the picture above, which was taken shortly before we took off. This is the route we flew. 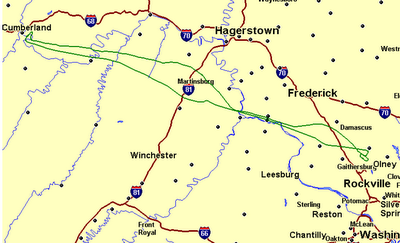 The arc over the top is the detour we took to see Harper's Ferry on our way down. Eric snagged several nice aerial photos. 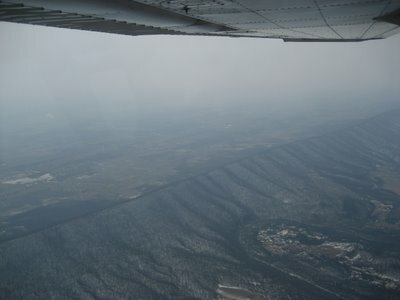 After flying over Harper's Ferry, we turned south and flew down the east side of the Blue Ridge Mountains. Skyline Drive snaked down the ridge below us and to our right. The golden fields in the valley to the right is Shenandoah Valley. In this next photo, we're a bit further to the East, Shenandoah Valley is on the other side of that ridge. While my eyes kept being drawn to the mountains off our right wing (and our left on the way back North), the landscape below us was gorgeous as well, with streams and rivers, beautiful farms and estates, and rolling hills. It was also fun for me to see through Eric's eyes what it was like to watch me fly the airplane. I remember all of the gauges, switches, etc., being overwhelming when I first started, but now it's nearly as comfortable as driving a car. We tried to go exploring. Unfortunately, the nearest place to get a good meal or cup of coffee was about a mile across the airport. Due to our later start, we didn't have much time. I needed to get the airplane back for the next guy that had it reserved, so we took off and headed North, back the way we came. We navigated and landed back in Gaithersburg without incident, a fun flight for both me and my first passenger. I flew yesterday morning with Eric G., a buddy o' mine that's lucky enough to live five minutes from the airport. When it was all said and done, I told him I was going to write about it and asked if he had a paragraph or something he might want to contribute. The following is what he wrote, and it's a bit long, so I'll just leave it with what he said and write about it myself in another entry. First of all, no other friend I have inspires as much confidence in his ability to master complicated stuff than Greg. (For those of you who really know Greg, you know exactly what I mean). Therefore, even though this was my first time in a single engine 2+2 seater (what some may jokingly call a "JFK Jr. Killin' Plane"), I approached Greg's "first flight with passenger" after recently getting his wings without even a stitch of trepidation. Our route was to take us from the Gaithersburg, MD, airport to the northwest - around the restricted Camp David area ("W" was in town and this area was even larger than ususal), over Harper's Ferry, WV, and then south along the Blue Ridge mountains/Skyline Drive (avoiding the "Class B" airspace around the Dulles flight pattern) and landing in Charlottesville, VA. His pre-flight planning was meticulous (of course), and he had weather reports, airport profiles and communication codes, maps, checklists and all kinds of stuff to make sure he had accounted for every possible circumstance and contingency. He even called right before he started up the engine to make sure the weather report he had (which was only an hour old at most) was "the most current/accurate." My only disappointment was that the lady on the radio didn't answer Greg's inquiry with a "Ground Control to Major Tom." I have to tell you - for a "rookie" Greg sure flies like an ace. I watched in amazement at the near surgical precision of his hands reaching for and fiddling with dials, knobs and buttons for the gizmos on the instrument panel while talking in some nonsensical languange with air traffic control - always ending each repeated command statement with "three-five-romeo" (the last few digits of our plane's ID number) - like "Climb and maintain 5,500 Three-Five-Romeo." He did not fumble or get flustered *once* throughout our flights. He maintained a series of checklists, flight lists, and maps within reach and followed every item on the checklist both pre-, during, and post-flight. Not like I would have known the difference, but watching him "thumb" each official-looking line item on the FAA checklists made me feel that much more comfortable knowing he was following every step and every rule. He answered my millions of questions about procedures and skills he was performing without hesitation. And the best part was that he was sporting the best "little kid grin" you can imagine. So, the flight itself? The flight was surprisingly smooth. I had expected a bunch of turbulence being a small plane and all, but once we were at altidude, it was almost as if we were standing still. It was a beautiful day and the scenery was spectacular. It's really cool to be only a couple thousand feet above the ground and going slow enough that you have time to focus on details on the ground below - but fast enough that you cover three times the territory you would in the same amount of time by car. I never got nervous or scared - even when we did run into some minor bumpy patches - which were no worse than being on a commercial jetliner. At the end of it all - Greg asked if I was "inspired" to go get flight training to become a pilot. But I have to tell you -after watching all the complicated stuff and numbers and charts he maneuvered with such proficiency I said that it's great fun, but I think I'm gonna leave it to a pro like Greg. So, if Greg ever asks "wanna come flying with me?" You should *definitely* say "HELL yeah!" without hesitation. He knows his stuff and it'll be an experience you'll really, really enjoy. I had even more fun than I had expected and was honored to be Greg's first passenger. Would I do it again!? OHMYGOSH- YES!!! We weren't even on the ground yet and we were already talking about the next place(s) we were going to fly. That's "Private Pilot - Airplane Single-Engine Land." Which is what I am as of today! It was a long day, and when I got home I walked the dog, then poured a hot bath, grabbed a cold beverage, picked up the latest copy of Flying magazine, and cranked the stereo. Jodie came home and stuck her head into the bathroom and burst out laughing. Then she went and got my logbook and read a bunch of the entries over the last YEAR AND FIVE MONTHS, then finished up with the last entry: "Private Pilot Checkride Satisfactory." The day started early, at 5 a.m. The airplane was finally fixed and flyable, the weather was good, the FAA Designated Examiner was available, and I could sneak away from the office for a couple hours. Everything just lined up. So I got up at 5 and met Rich at 6 to put a little spit and polish on my maneuvers. We flew with Eddie, his puppy, asleep in the back seat, and just ran through the airwork again, then landed back at Gaithersburg. I grabbed a breakfast sandwich and went to see the DE. "Come in, said the spider to the fly," he said when I knocked on his door. I went in, sat down, and we chatted for a minute. I had heard that one of the things he liked to do during a checkride was to plant a foot on the rudder pedal, so I asked him a question: what's the authority of a PIC to use physical force with a passenger that's interfering with the flight? He said the authority was pretty much unrestricted, as far as he knew, though he didn't know of a situation where it had been tested. We talked about a few other things, then he sent me out to finalize my preflight inspection and said he'd be out in a minute. He had me do a normal takeoff and I turned downwind, then exited the pattern toward the north. I started the timer as we passed over Davis airport and noted the time when we crossed I-70, my next checkpoint. The DE asked my what our groundspeed was and how long it would take us to fly to Capitol City. I spun my E6B flight computer and told him. He then told me to divert to Clearview airport and asked me when we'd be there. Several months ago I measured the width of my thumb on the scale of my sectional chart. I eyeballed the direction to Clearview and turned ten degrees east. Then I put my thumb on the chart and figured it was about a thumb and a third, or roughly nine miles. I told the DE we'd be there in five and a half minutes. Then I placed the edge of my E6B on the route to Clearview, moved it over the a nearby VOR compass rose, and got a more accurate magnetic heading, then adjusted our heading a couple degrees. A few minutes later we flew directly over Clearview, within seconds of my forecast arrival time. So far, so good. The DE then had me put on the hood, turn to a heading, then climb and turn to a different heading, then descend and turn to another heading. I discovered a while ago that I have a tendency under the hood to bank to the left. It's just what my inner ear does without visual stimulus -- everyone's different. And it happened. I was on the correct heading, looked up to confirm altitude and airspeed, and the DE said, "What heading are we on?" Aargh! I had drifted about eight degrees to the left off my assigned heading! I held my breath, wondering if he would tell me the test was over (indicating that I had failed), but he just took the controls and told me to look down at my lap. While I was looking down, he put the plane through some gyrations, then had me look up at the instruments. The airplane was in a left descending turn, and I quickly leveled the plane. The ball stayed out to the left. "Tell me to get my dang foot off the rudder," he said. "Take a lesson from the Alaskan bush pilot and get your dang foot off the rudder," I told him. He laughed and took his foot off the rudder. We did another recovery from an unusual attitude, and he had me take the hood off. So far, so good. He then had me do some steep (steeply banked) turns, which I did, remembering to ask him if he wanted me to do a clearing turn. He asked me which way I was going to turn first, and I said left. He asked me why, and I didn't have a good reason -- it was just a preference. We then had a nice discussion about the rules of one airplane passing another (on the right) and how turning to the left avoided the possibility of turning into a passing plane. I did a steep turn to the left and then to the right. Halfway through my turn to the right, he told me to take my hands off the yoke. I had given the plane two turns of nose-up trim as I entered the turn, and the plane pretty much held the turn and altitude with my hands off. He had me turn to a specific heading and then told me to do a power-off stall. I did, no problem, announcing the stall warning and break. He asked for a power-on stall. I configured the plane into a steep climb, and the airspeed bled off. But --- no stall warning horn, and no break. I was hauling back on the yoke, but all I got was a gentle buffet and mush. I thought he wanted a full break, so as the nose lowered a little, I pulled it up again. "That's good," he said. I asked him about the stall warning not coming on, but he didn't seem concerned. I had kept the heading and the ball centered throughout the procedure, as I was supposed to, and he was satisfied. We then headed to Carroll County airport. We weren't far from the airport, it was in sight, but we were a thousand feet above pattern altitude. The DE asked me slip the plane down to the correct altitude and enter the pattern on crosswind to see me fly a rectangular ground reference pattern. As I flew downwind, he told me to do a short-field landing. He pointed out the centerline markings on the runway, and told me to be 100 feet above the ground as I crossed the threshold, then to land by the third centerline marking. I had been over and over this by myself, making nearly every landing a short-field landing over the last few months. On final, I had 20 degrees of flaps and my airspeed was about 65 as I crossed the threshold. I was just exactly 100 feet above the ground as I crossed the runway threshold. As I crossed it, I put in the other 25 degrees of flaps, pointed the nose down, and chopped the power. I descended steeply in the 61-63 mph range, then flared. With those big Skyhawk flaps hanging out and my airspeed nice and low, the roundout has to be almost nonexistent - going straight into a flare. So I flared a little closer to the ground than with a normal landing -- I think it might have made him momentarily nervous because I saw his hands move out of the corner of my eye, but it was a good landing and we touched down baby-soft on the third centerline. I dropped the flaps, and we easily made the first turnoff. We stopped briefly so I could get a (not stiff) drink at the FBO, then taxied toward the departure end of the runway. The DE told me to do a short-field takeoff, so I did. There were some clumps of dirt on the first ten feet of the runway. Typically, I would have positioned the plane as close to the end as possible, but I told him that I didn't want to risk the prop picking up one of the dirt clods, so I started out 10-15 feet from the end of the runway, held the brakes, put in full power, then started rolling. I held the plane down slightly past Vr, and rotated as the plane approached Vx of 69 mph, then held the nose at the sky as we climbed through the first 75-100 feet, then nosed down for a Vy climb. As I turned downwind, the DE told me to prepare for a soft-field landing. Then, just after I passed alongside the arrival end of the runway, he reached over and cut the power. No problem, I thought, I can do this, but..... Wait a second! A soft-field landing requires adding a touch of power at touchdown to keep air flowing over the elevator and the nosewheel light. I said, "Soft-field with no power?" He responded that my engine would be magically working and available as soon as the wheels touched the runway. Okay, I thought, I can do that. In the past, I had reacted to simulated engine failures by turning immediately toward the runway. I always ended up too high and landing halfway down the runway, so I continued on downwind for a little bit, then turned base, added ten, then twenty degrees of flaps. Once I had the runway made, I added full flaps and touched down nicely, adding a bit of power to keep the nose light. After we were down, as I adjusted my feet, my toes touched the brakes (I have size 13 feet) just enough for it to be noticeable. "No brakes in a soft-field landing," the DE said. I held my breath again to hear him say that I had failed, but he was silent. I breathed a silent sigh of relief and turned off the runway. "Give me a soft-field takeoff, but instead of turning cross-wind, give me a heading 0f 200 on climbout." He spun the OBS on the VOR. "We'll intercept the 213 radial and go back to Gaithersburg." The test was almost over and he hadn't ended it yet!!! I called to activate my ADIZ flight plan and get my transponder code, and held my assigned heading and altitude on the dot. The flight back was uneventful. We chatted while I flew, then the DE took the controls and gave me some instruction. He showed me how with the airplane trimmed, pulling the power from 2350 RPM to 2000 RPM would give me a 500 foot-per-minute hands-free descent. I recalled when Rich had me fly some instrument approaches under the hood and mentally filed this away for my future instrument training, which will probably take place in this same plane. I made a good landing, turned off, and completed my after-landing checklist. As I taxied toward the ramp, I said, "You're having me taxi to park the plane, you haven't ended the checkride.... I'm wracking my brain for everything I can do to screw this up between here and the parking spot." He replied, "The checkride's not over until the chalks are in and the plane's tied down." I knew I had it made, and I already had a big grin on my face. After the plane was parked, he said, "Well, I don't see any reason why I shouldn't go type up that white form. Congratulations!" He shook my hand and headed toward his office while I secured and cleaned up the plane, then I headed to his office. "Come in, said the spider to the fly," he said when I knocked. He slid a white piece of paper across his desk. "Last question of the test, pass/fail, and you have only fifteen seconds. Tell me where you're supposed to sign this." I looked at the form while he counted out loud, and after 13 seconds found the signature line running vertically up the left side of the form. It was NOT intuitive. We chatted briefly. I told him I wanted to fly the VFR corridor between and below the BWI Class B airspace and the DC Flight Restricted Zone to Kentmorr airport, a grass field on the Chesapeake Bay, but that I wanted an instructor to go with me the first time. He said that was a good idea, that he'd be happy to fly with me anytime, and to call him if I wanted him to go with me. I asked him if there was anything he had seen that I could work on, and he said that he likes pilots to hold their maps up in front of their face so they don't have to move their heads up and down to look at the map and outside, which he said could lead to spatial disorientation. Other than that, he said that Rich (and John) did a fantastic job training me. I left his office and practically ran to my car, resisting the urge to jump and click my heels together or hold my arms out like wings. What an amazing feeling! On the way to the office for a meeting, I called Jodie, then Rich, then my dad. I had to be serious during the meeting, which lasted 4-5 hours, and by the time I got home around 7:30, it had been a LONG day. My smile was still plastered on my face as I poured the bath, grabbed a cold drink, and my latest Flying magazine. "Private Pilot Checkride Satisfactory." After I started the plane, the high-voltage light was on and the ammeter was moving back and forth. There had been electrical work done on the plane yesterday, and I knew that the power had been on while the electrical system was worked on, so I thought that maybe the battery was just low. Sure enough, when I performed the "run-up," the ammeter became steady and the light went out. Well, we rolled down the runway and took off, and the light came back on. Then it went out. Then it came on. As we headed away from the airport, Rich and I both said at the same time something to the effect that we needed to land and get the problem fixed, so I called ATC and told them we were returning to the airport. And we landed. Chloe went on her way, and I waited around until the examiner showed up. He suggested that we do the oral portion of the exam, and then see if any progress had been made with repairing the plane. We sat down with all the paperwork and he started to look through it. He asked me where I had gone on my long solo cross-country trip, and I told him I had gone to Cumberland, Hagerstown, and back. He said, "That's not 150 miles." I pulled out my chart and the regulations and, sure enough, that trip wasn't long enough to qualify. He looked at the computer and said, 739BA is available." He handed me back the check I had given him to pay for the exam. He pointed out that I had been signed off by Rich to fly to both Lancaster and Hagerstown, and told me to go fly a loop and come back. 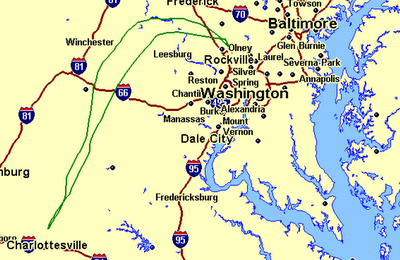 Gaithersburg to Lancaster to Hagerstown and back to Gaithersburg would be well more than 150 miles. So I did. I kept the plane near full power (though careful not to overspeed the propeller) and headed to Lancaster. Two hours later, I entered a bumpy pattern to land at Gaithersburg, and did all right considering the stiff crosswind. The examiner and I then sat down to do the oral portion of the exam. First, he made me read sections of the regulations that described his role, then he went through the rest of my paperwork. We started talking about the cross-country flight he had had me plan for the checkride, and we talked through it. We went from there, and I honestly can't remember everything we talked about. At different times in the conversation we were poring over charts, regulations, the Pilot's Operating Handbook for the plane.... We reviewed the weight and balance calculations I had performed and he asked what I would do if we were at maximum gross weight and our center of gravity was one inch aft of the limit. He then gave me a formula to calculate how much weight I would need to move how many inches. He also told me a "rule of thumb" for converting fahrenheit to celsius and vice versa. He asked me what the acronym "LAHSO" meant to me. I told him it referred to "land and hold short operations." He asked me what I would do if I were approaching an airport and was asked to land on a runway and hold short of another runway. I told him that as a student pilot, I would tell the controller that I was unable to comply (student pilots are not allowed to participate in LAHSO). He said I should assume I'm a private pilot -- then what would I do. I said it depends on how much runway they were giving me, and he then asked me where I would find that information. I pulled out the Airport/Facilities Directory and flipped to the back where the information was listed. 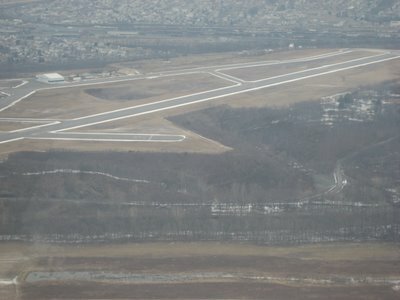 For the airport he had referred to, I would have about 3,800 feet of runway to use, which is far more than I need even on a bad landing, and I told him that I would be willing to comply with a LAHSO request. He then asked me what would happen if I had agreed to comply with a LAHSO instruction, and a deer ran onto the runway as I approached. I told him I would go around, and he pointed out that an airplane could be taking off on the crossing runway. It was clear that the "correct" answer as far as he was concerned was never to comply with a LAHSO instruction and always say "Unable." I asked him if he had ever followed a LAHSO instruction, and he said he had not, although he had received such instructions. Another scenario he asked me about was a situation where I had flown to an airport and due to some system failure the flaps were stuck at 10 degrees. He said that the nearest airport where I could get it fixed was 25 miles away, and asked me whether I could fly the plane to that airport. I told him that this very question had come up recently on a couple flying instruction web forums, and asked if the answer is open to differing opinions. He said that it was, so long as I demonstrate "sound judgment." I told him that because the POH for this plane allows takeoffs with ten degrees of flaps (for soft-field takeoffs), then I thought it would be safe and legal to take off and fly the 25 miles (while keeping the airspeed well within the Vfe airspeed -- the maximum airspeed at which flaps can be extended). I also told him that Adam, another pilot in my club, was of the opinion that the flaps would have to be placarded as inoperable. He stopped and thought for a moment and said that that made sense. On the issue of "sound judgment," he had pointed out in the regulations at the beginning of the exam that "sound judgment" in an applicant was one of the things he was looking for. He said that the definition of sound judgment is open to interpretation, and I offered my definition. I told him that sound judgment, to me, is a clearly defined set of priorities that are NOT weighed against each other. In order of importance, I told him that my safety and the safety of my passengers was at the top of the list, that safety of airplane was second, that compliance with laws and regulations was third, and that convenience/deadlines/etc. was last. If the safety of my passengers and myself was in question, then the aircraft, regulations and convenience be damned. Likewise, even if safety of the people was not in question, but damage to the aircraft was likely, then compliance and regulations and convenience be damned. And finally, even if the safety of the people and aircraft was not at issue, but compliance with regulations prohibit something, then convenience and meeting deadlines were simply non-issues. (It's helpful to note that if the safety of the passengers or airplane are in question, then it will almost always qualify as an emergency, in which case the pilot is expressly authorized to deviate from regulatory requirements, ATC instructions, etc.). He told me that there were six activities we could perform "under the hood," but that only one, recovery from unusual attitudes, was required. He handed me a dice and told me to roll it twice. I did, and he circled two tasks I'll have to complete when we fly together. He then told me that there were three ground-reference maneuvers he could have me complete, and told me to roll the dice again. I rolled, and he told me I had "won the right" to fly a rectangular pattern. We continued talking, and he asked me about the airplane: how many hydraulic systems, where they are, how the fuel system works, how the flaps work, and so on. At one point, he asked me what would happen if a bumblebee stopped up the fuel tank vents. "Nothing," I said. "Well, wouldn't a vacuum form as the fuel is removed from the tank, so eventually the fuel wouldn't flow?" he asked. "No," I replied, "because the gas caps are vented just for that contingency." "Smartass," he said. At the end of the day, I passed the oral exam. I'm glad it's over, and I wish the whole thing were over. Between staying up until near-midnight last night studying, and then waking up at 4:15 this morning to go fly with Rich, plus the fatigue from a long flight and then the oral exam.... I'm pretty well worn out. And I'm still at work. And I still don't have my pilot's license. So I may go do the flying portion of the exam tomorrow, if the airplane is flying again. The examiner called me a couple hours ago to tell me that the mechanics thought they had it fixed, and took it for a test flight only to see the problem return. There may or may not be an airplane available tomorrow to take the test. I really can't afford another day out of the office, but I'll do it if I can take the checkride tomorrow. Right now I'm going home. Today I finished all of the requirements to take the checkride for my license. I had planned to fly early this morning, taking off at 8 a.m. to fly to Cumberland, Maryland, and back. Then, Rich was going to meet me to finish up some hood work (simulated instrument flying) and go over the maneuvers I need to have polished for my checkride. When I arrived at the airport, the weather was great at the airport, and it was great all the way to Cumberland, but.... The temperature at Cumberland was -1 degree Celsius, and the dewpoint was -2 degrees celsius. The difference between the temperature and the dewpoint is referred to as the temperature-dewpoint spread. When the temperature-dewpoint spread is zero, visible moisture forms as fog and clouds. Cumberland is in the mountains, and I didn't want to be flying there with fog and/or clouds in the way, so I waited on the ground for the temperature to rise as forecast and the temperature-dewpoint spread to increase. By 9:30, the temperature at Cumberland was 3 degrees, and the dewpoint was -2. That was enough of a "spread" for me, so I took off at about 10 o'clock and headed West. I navigated by pilotage, using a map and checking it against landmarks on the ground. I programmed the route into the GPS for backup, but didn't use it for navigation. A couple times, I saw from landmarks on the ground that I was off course and had to correct, turning to head where I could see I wanted to be. It was somewhat hazy and there was a strong wind, neither of which helped to keep my course straight. You can see the corrections on my GPS track -- you can also see that where I had an easy landmark to follow (a river), my course was nice and straight. Harpers Ferry, West Virginia, the site of the infamous John Brown rebellion to free the slaves, was one of my visual checkpoints. It's easy to pick out because of the break in the hills, the rivers coming together, and the arrangement of the buildings in this cute little town. Although there was little to no snow where I live, snow started appearing as I flew West. As I flew over the ridge in this next picture, there was a stark line at the top -- no snow on the southeastern side of the ridge, but snow on the northwestern side. I scrambled for my camera, but I was already past the ridge by the time I snapped a picture and didn't want to turn back. My airspeed was a constant 120 mph, but there was a strong headwind from the southwest, so my groundspeed was only about 80-85 mph. 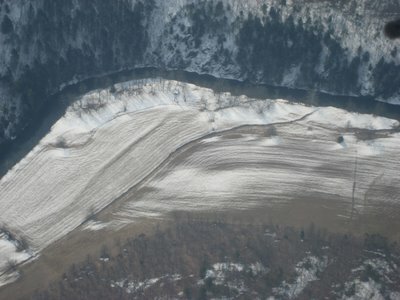 Interestingly, although there was no wind reported at my destination in Cumberland, you could see the patterns made by the wind in the snow below me -- it was beautiful. In all, it took me about an hour and twenty minutes to get to Cumberland because of the headwind. The airport is between two ridges, so I dropped over the ridge to the East and entered the traffic pattern. I landed, used the bathroom, and got somebody to sign my logbook to show I'd been there, then called Rich to let him know I'd arrived and was heading back. I taxied down to the beginning of the runway and went through my pre-takeoff checks. When I checked the magnetos, there was a large RPM drop on the right magneto and the engine sounded very rough. I had heard of this happening -- lead from the fuel can foul the spark plugs. I checked the Pilot's Operating Handbook, which said to run the same checks at a higher RPM, which I did. The engine smoothed out, but to double-check I called Rich. He confirmed that I had done the right thing, and that as the plane was now running smoothly, I had burned off the lead and it was safe to fly. I turned onto the runway and took off heading East. I snapped a quick photo over my shoulder as I climbed up and over the first ridge. I called Flight Watch to get an update on the weather heading back home and filed a pilot report. Before I left to head to Cumberland, I had been warned of moderate turbulence below 8,000 feet, and I wanted to let them know that there was no turbulence at all at my cruising altitude of 4,500 feet. After the pilot report was filed, I contacted Air Traffic Control to get Flight Following and continued on my way. One of my headsets has a feature that lets me plug a music device into it. It's supposed to mute the music whenever something comes across the radio, and I decided to give it a try. While continuing to look for traffic I plugged my iPod into my headset and pushed "Play" on my playlist of flying songs. It worked beautifully. If I pushed the microphone away from my mouth, I could sing along and nobody would hear my off-key crooning! When Air Traffic Control or I talked on the radio, the music automatically muted. It was great, and made the relatively short flight back to Gaithersburg seem even shorter. Rich was waiting with his new puppy when I landed, and we took off again to go finish the training I needed. I flew under the hood, by instruments, and Rich demonstrated a soft-field landing. I would have liked to polish up some other maneuvers with Rich, but my late start to Cumberland meant we had to cut the flight short. I've now completed everything I need to take my checkride, and Rich is submitting the form this weekend. 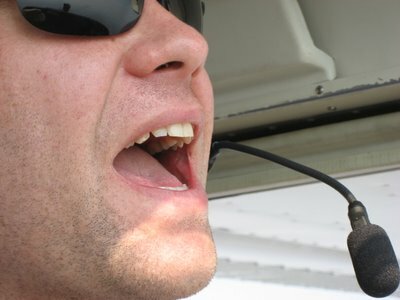 The FAA's Designated Examiner has confirmed that he is free all of this coming week, so I'll be scheduling time with him and.... [gulp] taking the practical test in the next few days. I'm nervous. When I arrived home from flying tonight, our neighbor and friend was visiting with Jodie. After I said hello and told them I had a good flight, Ceni remarked at how happy I seemed. She then had to demonstrate my posture, mood, and lack of affect when she's seen me after a normal work day compared to how I seemed when I came in. She made me laugh, but it's true -- flying generates a "high" that lasts long after the flight. I think it's one of the few reasons that Jodie doesn't object to me flying -- simply because it makes me happy, which makes her happy. When we were in Knoxville last Thanksgiving and I went for a flight, Jodie greeted me on my return with "Let me see how big your smile is!" She's so wonderful. Last night truly was a great flight. Rich and I took off from Gaithersburg at about 7 pm. Immediately after takeoff, I put on the hood to fly by reference to instruments only. I kept the hood on while we flew north toward the Pennsylvania border. Rich had me practice all sorts of "normal" maneuvers, such as climbing and descending turns, then he took control of the plane. There's a concept in flying referred to as "positive transfer of control," and it involves a verbal exchange to make sure that everyone is clear who is in control. There are three steps. When Rich wants to take the plane, he says, "I have the controls," or "My plane." I then respond by saying "You have the controls," or "Your plane." Rich then confirms by repeating "I have the controls," or "My plane." The transfer also works in reverse, so if Rich wants me to take control, he says, "Your plane," or "You have the controls." I confirm that I have the plane, and Rich repeats. After Rich took control of the plane, I still had the hood on, and he told me to look down at my lap so I couldn't see any of the instruments and gauges. Rich then put the airplane through a series of maneuvers -- nose up, power off, hard right bank, nose down, nose up, power on full, bank left, nose down -- all over the place. Then he said, "Your plane." With the hood, I couldn't see outside to get any visual reference for which way was up. And with all the "yanking and banking," my inner ear was telling me all sorts of confusing and contradictory things. I honestly didn't know which way was up. "My plane," I said. "Your plane," Rich repeated. I looked at the airspeed indicator -- our airspeed was low, near stalling speed, but increasing rapidly. The altimeter said were descending rapidly. I pulled the power out to idle. I looked at the attitude indicator and directional gyro. Our wings were banked way over to the right and we were turning quickly. I banked the plane back to the left and pulled back. I cross-checked the attitude indicator against the turn and bank indicator to confirm which way our wings were banked (in case the gyroscope in the attitude indicator had failed) and to make sure the "ball" was centered. The directional gyro said we had stopped turning, and the altimeter said we had leveled off and actually started a slight climb. Airspeed was dropping off very quickly -- I added power and pushed the nose over slightly. A few seconds after Rich had given me control, I had the plane flying straight and level, then climbing back to our starting altitude. Whoa. That was my first recovery from an "unusual attitude" by reference to instruments only. And I did it! Rich critiqued me -- I had been a little slow getting the wings level and nose up. "Let's do it again," he said. "My plane." We did a bunch of those, I'm not sure how many. At one point, while I was looking down and Rich was controlling the plane, he pushed the nose over hard and we experienced some negative Gs. My stomach went from my toes to my throat, back to my toes. It felt like riding a roller coaster with my eyes shut. By the end of the night, though, I was quickly and confidently bringing the plane back to straight and level flight after Rich's roller coaster rides. I found that I didn't need to stop and think to interpret the instruments so much -- if the attitude indicator and turn and bank indicator said we were banking right, I instinctively banked left to get the wings level. It was a great exercise, and after repating it for a while, we headed for Carroll County Airport to practice some more performance take-offs and landings. Short field, soft field, slips to a landing, simulated engine failures.... When we finally took off to head back to Gaithersburg, I put the hood back on, navigating and controlling by instruments only. On the way, Rich had me do a couple more recoveries from unusual attitudes, which I now did easily. What a great flight! My confidence level is high, though my stomach was a little queasy after all the blind maneuvering. It was gratifying to see Rich searching in the baggage compartment for miscellaneous items from his flight bag -- the negative Gs made his flight bag in the back seat hit the ceiling and scattered stuff throughout the plane. It was 9:30 pm as I headed home and stopped at McDonalds for something to eat -- I shouldn't have eaten with my stomach churned up like that. I didn't get sick, but I wasn't feeling well through the rest of the night. I FINALLY got in the air again tonight with Rich. Two months since my last flight, with work and weather, a weekend away, and Rich's schedule, nothing seemed to work right for the last 8 weeks. My solo endorsement expired a day or two after my last flight, so I was grounded until I could fly with Rich. Since John had been the one to solo me, Rich wanted to fly with me and run through some basic airwork and pattern work before he signed me off to fly solo. It finally came together tonight, and what a gorgeous night it was! It's been severe clear here for the last few days, but cold and very windy. All through the day the wind was variable from 320 to 020 with wind speeds up to 19 and gusting to 29 knots. It was forecast to die down, and it did, so when Rich and I took off at about 7 p.m., the wind was steady at 7 knots. The clear air meant that everything looked close. From our perch 3,000 feet in the air, we could see two ski slopes in the distance, lit up for night skiing, Baltimore, Washington, Dulles International Airport, Reagan National Airport.... It was beautiful. First we practiced some forward slips at a high altitude, then we flew over to Carroll County to practice some landings. I did slips to a landing, short-field, soft-field landings, short- and soft-field takeoffs. In all, I did five landings, which completes my requirement for night take-offs and landings. At the end of the night, Rich endorsed my logbook so that I can fly solo for another 90 days. He also signed me off to fly repeatedly to Carroll County. That now makes two airports I can fly to, including Frederick.